But rooting also void your warranty. Which means if your phone is rooted then your Manufacturer might not provide you that service which they provide if you hadn’t rooted your device. Then what to do and get your warranty back. Universal Unroot is there to help you out. 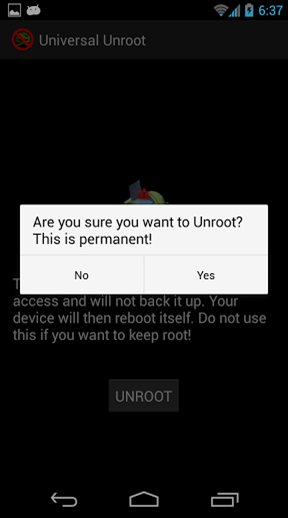 Universal Unroot will Unroot almost any Android powered device that is already Rooted and has a form of Superuser installed. The process is very simple just run the app and tab on UNROOT button and allow Root Access when asked to give it permission. 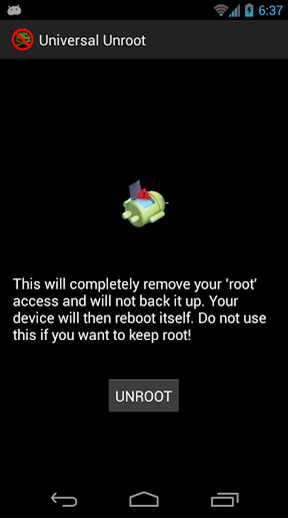 The device will then reboot and you will be completely Unrooted when you boot back up. This is a great app for those who are trying to complete a warranty return with a carrier for a defective device hardware or a repair. If you only want to temporarily lose Root Access, this app is not for you. Unrooting is permanent and cannot be undone with this app. Only use this if you truly want to lose Root Access. This app will cost $0.99 and if doesn’t work on your device then you can contact developer to get your money back.